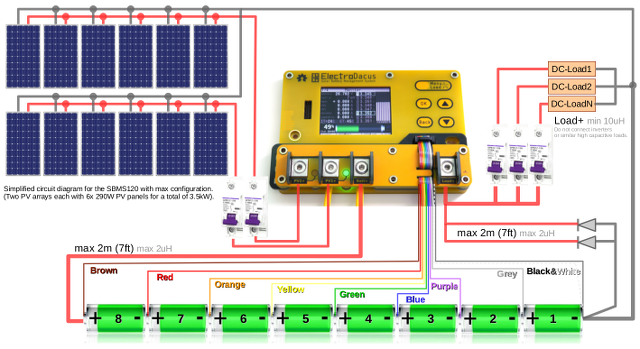 Solar BMS (Solar Battery Management System) is a solar charge controller designed to replace the Lead Acid solar charge controllers most people use today in Offgrid, RV, Boats and multiple other applications with 12V and 24V systems. Solar BMS can be used with 3 up to 8 Lithium cells in series (any type) or even supercapacitors. Any number of parallel cells are no different from a single larger capacity cell so it will just count as one. The new SBMS100 will have multiple improvements over the first generation SBMS4080 see further for details. Simplified circuit diagram for the SBMS120 with max configuration. 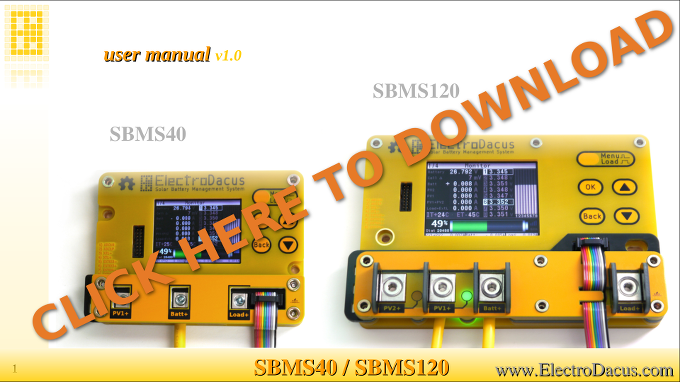 SBMS0 will soon be added to the SBMS40 and SBMS120 user manual. SBMS0 will be a cut down version of SBMS40 (no power electronics and WiFi) but those can be added externally. 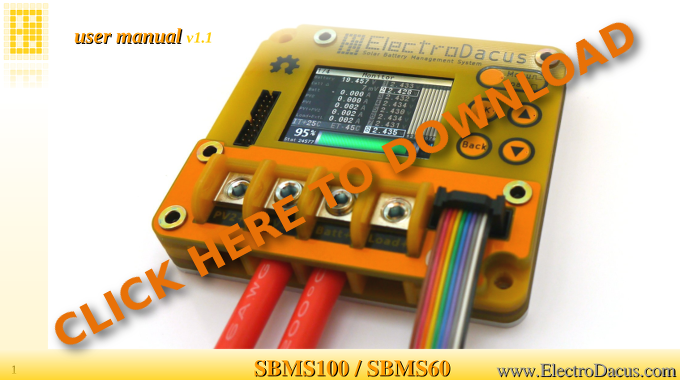 SBMS60 and SBMS100 are replaced by the new SBMS40 and SBMS120, but this is the latest user manual version. DMPPT is most likely not what you think, so please read the presentation and spec. 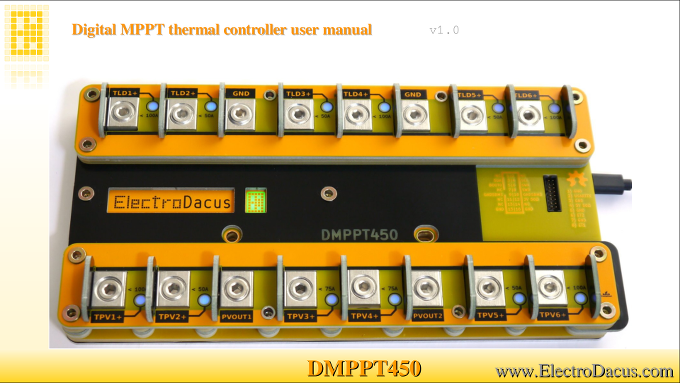 DMPPT was mostly designed to fully heat my small energy efficient house with solar PV. If all you need is to heat a bit of water with the excess from your small (less than 3kWh) PV array then that can be done with SBMS and some external SSR. 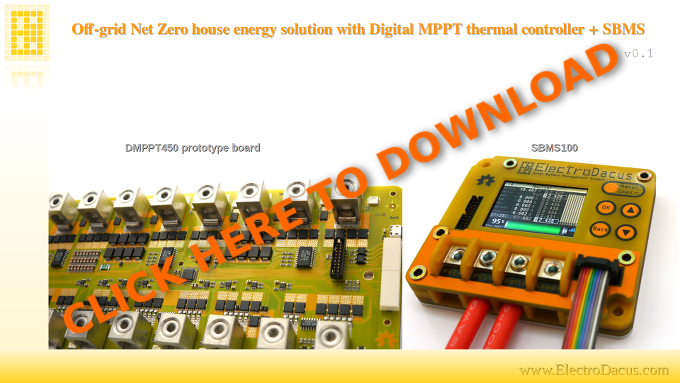 Click on below image to download the Digital MPPT presentation. I will be asking for shipping when I'm ready to ship around June for this batch.